You are here: Home / News / Business Services Employee Spotlight- Diana Redmond! Welcome back! 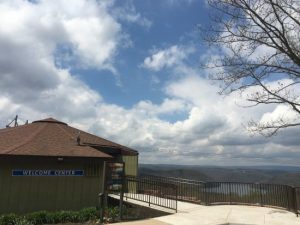 If you have ever driven to the Western edge of Maryland and stopped at the Youghiogheny Rest Area and Overlook, you know what a visual gem it is. When you enter the Welcome Center, you will find an abundance of interesting information and you will likely get a chance to be greeted by the smiling face that is the inspiration for this week’s blog entry, Diana Redmond! Like many of the staff that are working on Goodwill contracts, Diana has a story to tell about how she has benefited from our services. Mobility became an issue for Diana after a car crash, but not in the way that you might assume. Rather than needing to spend long periods of time resting, for Diana it was just the opposite. The nature of her injuries made it so that remaining stationary (sitting or standing) for long periods of time caused her pain. She had a need to be on the move and we needed a motivated individual to cover the grounds of this expansive facility. Diana smiling on the Job! After showing her value as a custodian, Diana was promoted to become the supervisor of this site. In this capacity she has many duties that require her to be active and that is a perfect fit for her. The staff she oversees requires her attention and to keep up with them, she is always on the move! Diana says that she “likes the structure of the job and it’s close to home”. Much of Horizon Goodwill’s territory is rural and for many, transportation is not readily available. The logistics of simply getting to a job site can create a barrier to employment when the area you live in has limited job opportunities. Diana is truly a perfect fit in this sparsely populated area and another example of how Horizon Goodwill’s services benefit individuals even in remote locations.